The Economic Development Committee has issued an invitation. As you may recall, the committee solicited expert advice from the Urban Land Institute on ways to improve the downtown Main Street area. The Economic Development Committee invites you to join them for their fourth “Downtown Initiative” forum. 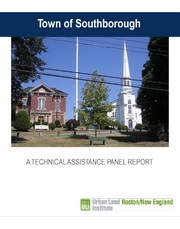 This session will highlight the recommendations of the Urban Land Institute’s (ULI) report following ULI’s on-site visit to Southborough and its study of Main Street. The EDC will present the report recommendations and EDC’s plans for 2019, with a focus on open public discussion and Q&A from residents and businesses. enhanced ‘public spaces’ in the Downtown area and trail connectivity. This is your opportunity to hear and discuss recommendations for revitalizing the Downtown area while keeping Southborough’s attraction and charm. Join us in being a part in developing consensus for all involved parties and addressing challenges. The meeting will be held February 7th (Town House Hearing Room @ 7PM). Please contact the EDC office if you have any questions 508-485-0710 x3011 or email EDC Office. Updated (1/29/19 9:43 am): I inserted a link to past coverage of EDC’s efforts to revitalize the Downtown Business Village. Updated (1/29/19 2:27 pm): I’m adding another link. It turns out that you can preview the report. Click here to read what ULI had to say – then bring any questions you have to EDC’s forum. Southborough will never look classy until we bury the mess of overhead cables above the downtown street. Let’s put that back on the agenda please! I don’t need anymore money out of my pocket just because of some power lines in downtown Southborough where I spend about 4 seconds driving through. Hudson just did that, and Hopkinton. Is about to do it … Just through their historic downtowns … as part of major road improvments, while the roads were dug up. This would be an excellent opportunity for Fay and St. Marks to step up and fund the undergrounding. They would be substantial beneficiaries and would make a small dent in the massive subsidy that the town gives them.